I am taking part in Kids’ Clothes Week this week, so brace yourself for lots of sewing related posts from me in the next few days. I make no apology, I love sewing and I love sharing what I have made in the hope that it will inspire just one person out there to start making something for themselves. I have been intending to make a school dress for Charlotte since she started back at the beginning of September and as usual life and work has done it’s level best to get in the way. Kids’ clothes week is just the push I needed to get some focus and get it done. 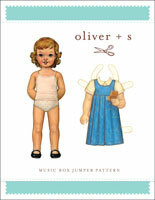 I bought the Oliver + S Music Box Jumper Dress pattern (yes, an actual paper sewing pattern) when I went to Guthrie & Ghani on my Birthday . I bought some grey fabric from my local Watson and Thornton a while back, gave it a wash and it’s been sitting in my workroom. I realise that grey is a rather less than exciting colour when it comes to the blog, but school is school in the UK, and grey it is. Just plain grey, no fancy coloured piping, no matter how much I want to do it!